Recently I was tagged by the awesome Emma over at Emsypickle to join in with this Would you rather? tag! I really enjoying posts like these and seeing everyones answers and seeing as it was a Beauty edition I thought why not?! 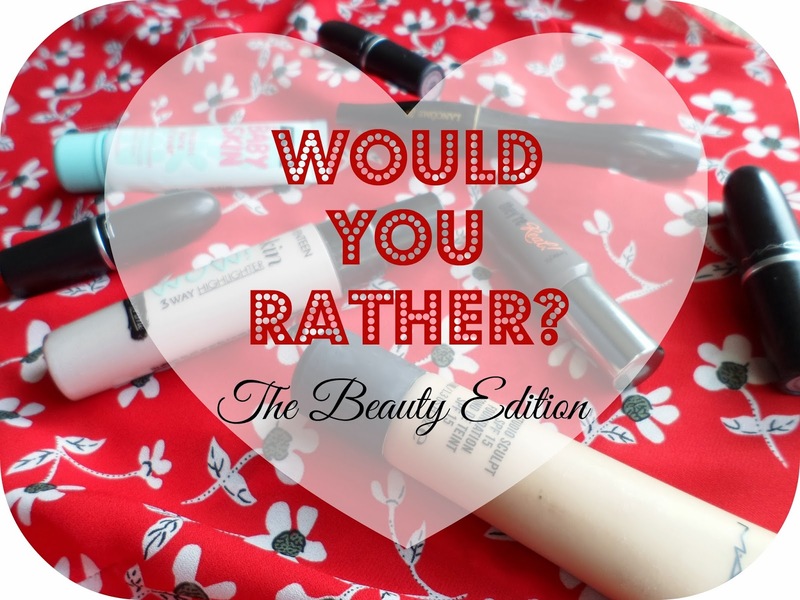 So here we are the Would You Rather Beauty Edition Tag! Easy peasy first question! Would have to loose my palettes and eyeshadows. I only ever really wear them for a nice occasion or when I got out so I think I couldn't easily live without them .... whereas mascara and lipstick - hell no! This is a tough one! I think I would have to say chop off all my hair! It would look awful but I hate the thought of never being able to cut it again - ewww! And there's extensions, hair pieces, wigs.... so I'd find a way to make it work! I'd have to say a coral cheek! I'm not one for blusher - especially pinks, so I would say coral! Ahhhhh this is a toughy for me .... the thought of going on a major clothing spending spree is amazing BUT I'm going to be sensible and say Make-up. Mainly because it would last so so much longer! After I've worn something alot I'm over it and it will sit at the back of my wardrobe - whereas some fab make-up would last ages... and think how much you could buy with £1000! I mean pink eyes are quite in and so are dark lips! But I think I'd say lipstick as eyeliner - I could rock that right? And think of all the colours of lipstick there are.... could get some great nudes and make a fab eyeliner! One eyeshadow for sure! It would be a nice neutral nice colour - I HAVE to have my lip collection! You've got to say summer clothes in winter! Can easily layer up lots (and add some tights... people wear those in summer!) - the thought of being in heat with a huge jumper, scarf and jeans on is horrible! I'm such a sucker for dark nails - I think black looks gorgeous all year round.... but I think there is so much more choice with bright nails - pastels, neons, pinks, blues, greens, purples - I'd say bright! Messy bun! I basically do this everyday anyway! Am I allowed lipstick and lipbalm? Because if the ban is just on lipgloss then I'd have to keep my nail colours! I cannot stand having bare nails - on both fingers AND toes... gross! hahahaha! I would rather shave my eyebrows and then pencil them in everyday! Sharpie... just no! I would rather live without nail polish! I wouldn't enjoy life without make-up, what would I spend my money on?! and I would look about 14! I love doing a good tag post - a big thank you to the lovely Emma! Check out her answers here. I tag : EVERYONE - let me know if you join in! Labels: eyebrows, eyeliner, eyeshadow, lipstick, mac, sephora, tag, tag post, the beauty edition, would you rather? This post totally made me laugh. So kooky! I agree 100% on question 1.